Here are some words and phrases you’ll see on bulletin boards and signs along the French canals. The examples below are organized in three columns, showing the English, French and Pronunciation for each word or phrase. Notice that certain letters are printed in gray in the French column. These letters are silent in that French word. So don't pronounce the gray letters. An halte nautique or halte fluviale is a place along the waterway where you can tie up for a few hours or a few days – usually for free. They provide a great way to visit the towns along the waterway. An halte will have some bollards or rings to tie to and sometimes offers water, electricity, trashcans, or bathrooms. In contrast, a port de plaisance is a marina with more extensive facilities and a charge for dockage. An halte is generally a rest stop. • an halte routière is a rest stop along a road or highway. 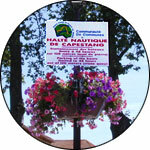 • an halte nautique is thus a nautical rest stop for boats. • an halte fluviale is a rest stop along a river or waterway. Voies Navigables de France (VNF) translates as Waterways of France. Waterway in French is either voie d’eau (literally way of water) or voie navigable (navigable way), the two phrases are interchangeable. You’ll see Voies Navigables de France everywhere on the canals because they are the French governmental agency in charge of the French waterways. They maintain, administer and promote the 6,700 kilometers of waterways under their jurisdiction. You’ll see the VNF logo on the lockkeepers’ shirts because lockkeepers are employed by the VNF. VNF maintains the signage along the waterways – the notice board (panneau) posted at each lock alerts you to scheduled closures, lock opening hours, etc.. If you want to take your own boat on the French waterways, you will contact the VNF to obtain your vignette - a permit that allows your boat to travel on inland waterways. The VNF has offices in major ports along the waterways. Le point kilométrique (or more commonly: le PK) is the distance marker on the French waterway, similar to the mile markers on the US Intracoastal Waterway. Usually distances along the waterway are measured in kilometers starting at the upstream origin of the waterway, although occasionally another point is chosen for PK 0. Dégustation! – that’s always a welcome sign along the waterway. 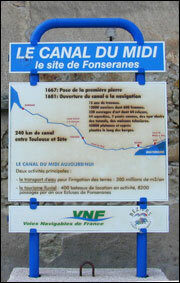 When the waterways travel through wine country, signs announcing dégustation dot the canal banks. The word dégustation means tasting and can apply to cheeses and other foods as well as wine. But when you see the sign along the waterway, it usually means that you’ve found a spot to taste and buy wine. Generally, the tasting is gratuite – free of charge, and a great excuse for a sampling of the local wines. 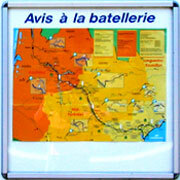 The Avis à la batellerie is a regular Notice to Inland Mariners that reports problems and changes along the waterways. Batellerie is a term that is used to refer to the professional users of the waterway – the persons who transport goods or passengers on the inland waterways. These professionals are also referred to as mariniers. Chômage is the closure of locks and sections of waterway for annual maintenance. The Avis à la Batellerie will list the dates and locations of these closures. Navigation during a chômage may be interrupted or just restricted. In other contexts, the word chômage is also used to refer to layoffs and unemployment. For more words and phrases related to Locks and Waterways see the Canals and Waterways chapter in FRENCH FOR CRUISERS.